Each town is more charming than the last, with its distinctive half-timbered houses, endearingly crooked and vibrant facades and a cuisine all its own. The dishes sound almost as foreign as their town names: Tarte flambée (Flammekueche), Choucroute, Baeckoffe… Go into any bookstore (even the newsstand in Strasbourg’s train station) and you will see an impressive selection of Alsatian cookbooks, as well as books on the history of the region, some with old illustrations of kugelhopf in Ribeauvillé. And oh those signs ! Just like my best advice in Appenzell was to keep your “Heads Up,” here you should do the same. The decorative wrought irons signs (indicative of the business), architecture and so many details not to miss. 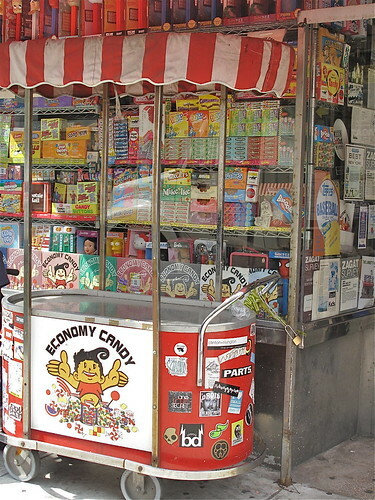 Only, bring those eyes back down to the store fronts where you’ll see traditional pottery, bakeries with macarons d’Alsace in the windows (resembling coconut macaroons, not Parisian macarons) and menus outside restaurants luring you in with those exotic sounding dishes. 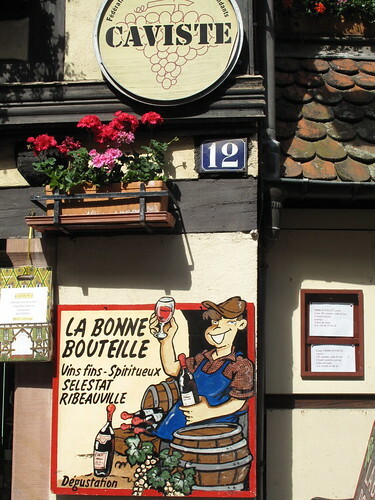 Plenty of wine shops too, one after another, with signs outside that welcome you in for a dégustation, a free tasting of their vins d’Alsace before you buy: Riesling, Gewürztraminer, Sylvaner, Pinot Blanc, Pinot Gris… If you’re a white wine drinker, you’re in the right place. We were happy and relieved to see so many shop doors open on a Sunday, but next time we’ll go when a visit to the winery’s cellar is possible. 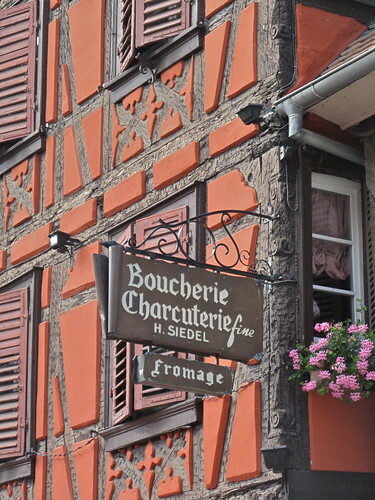 We followed the recommendation of a local baker and spent a leisurely hour at Louis Sipp, where a Riesling Kirchberg de Ribeauvillé Grand Cru 2006 stole the show. The family who owns the vineyards is there to share small tastes of several varieties of their wine and answer any questions, 101 of which we had. And now let’s talk kugelhopf ! There’s nary a boulangerie or pâtisserie without a large kugelhopf in its window, this yeast-risen brioche-like cross between bread and cake. 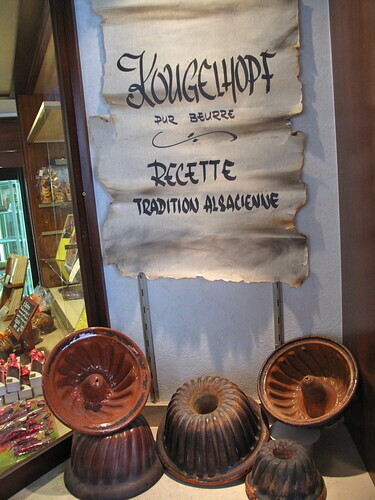 When in Colmar in 2008, I discovered a fantastic kugelhopf (and langhopf) at Pâtisserie Gilg and I was pleased to see they had a shop in Ribeauvillé too. 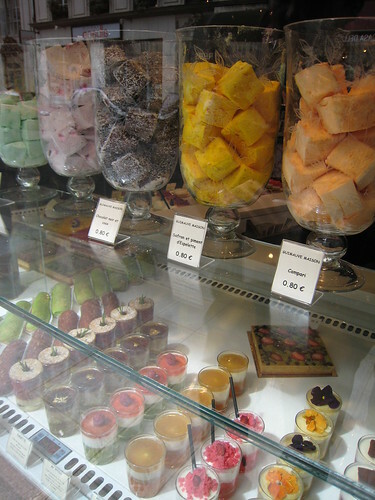 But I had my eyes set on Pâtisserie Schaal, where many say Rémy Schaal’s kugelhopf is the best around. I spotted the shop from afar with its bright blue shutters above and sign out front, proudly showing membership of the Confédération Nationale des Artisans Pâtissiers. Inside, it was big smiles and friendly conversation with Rémy Schaal and his wife, Isabelle. As Rémy wasn’t quite in baker’s whites, my fellow New Yorkers and I could only giggle at his Texas t-shirt (below). 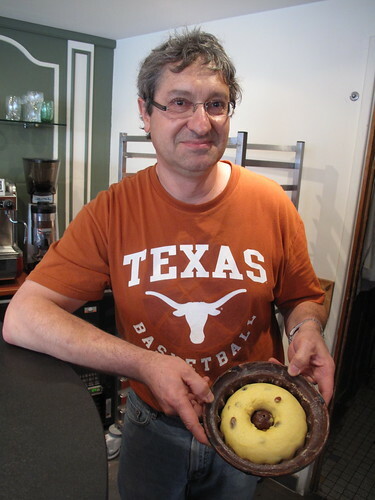 With a smirk, he walked us toward the mini shrine to Texas in the back of the shop – he lived and worked in Dallas for over 20 years for La Madeleine before moving back to Alsace in 2003 to take over what was the Keller family’s pastry shop. 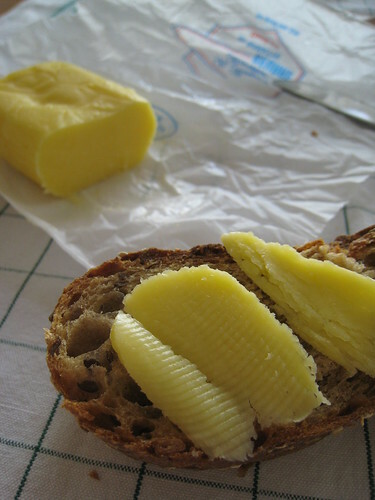 Celebrity chef Hubert Keller is perhaps best known for his restaurant Fleur de Lys in San Francisco, and even though he wasn’t in pastry himself, chances are he helped his father and brother butter all the kugelhopf molds as a kid. 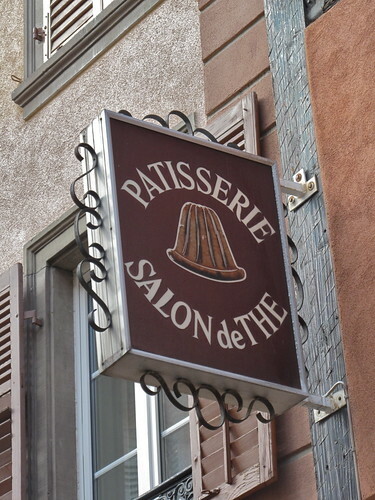 As I laughed with Isabelle about the name of my site, Rémy disappeared into the back of the bakery to grab one of his kugelhopf molds with the dough resting in it. “I let it sit for a good 12 hours. A must. Never less than 12 hours.” When I asked Rémy if he uses a traditional recipe that’s similar to that of bakers around Alsace, he told me his was richer, with very little water. Maintaining a proper balance, the moisture is coming only from eggs and butter, “not good for cholesterol or diet,” he advised. More flavors and aromas develop during the long fermentation, which can be 12-14 hours. After a leisurely stroll around the village (and obligatory wine tasting), we were finally able to come back to the bakery to take our kugelhopf home. 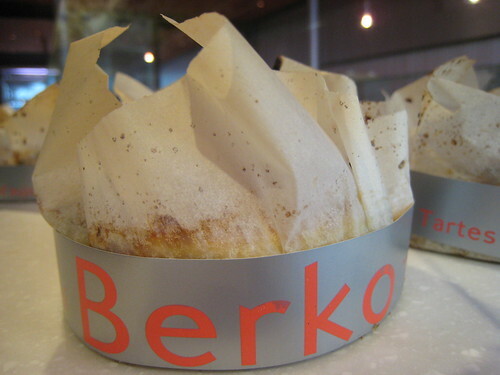 (See below, the real meaning of – that kugelhopf’s got my name on it !) Why the wait ? It had just come out of the oven and was still hot. Normally nothing can stop me from jumping at bread, cookies or cakes fresh and still warm from the oven, but a kugelhopf is best the next day or even a few days later. 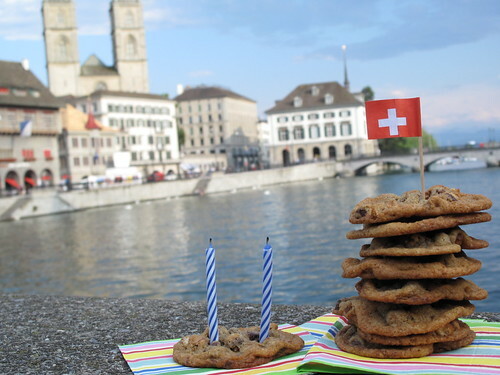 We all patiently waited the next morning back in Zürich, and dipped our slices into bowls of coffee. I always thought that was the typical – and thus best – way to eat kugelhopf. 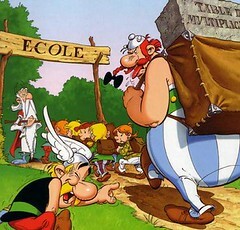 But Rémy has since corrected me… “You have to come back to Ribeauvillé and have it slightly toasted, with foie gras. 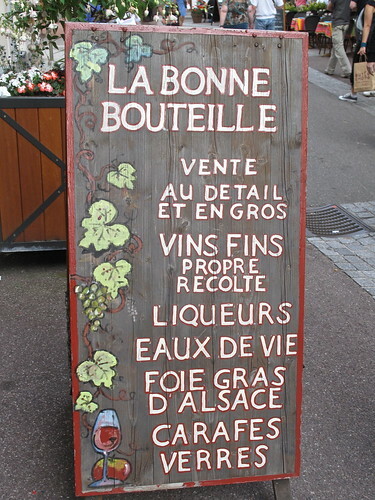 French would serve it with Sauternes, but here, Alsatians pour a glass of Sélection Grains Nobles.” Ok ! Merci Rémy et Isabelle, cela m’a fait grand plaisir de vous rencontrer et de découvrir votre kugelhopf, un vrai délice ! À bientôt, j’espère ! A wonderful pilgrimage to the birth place of the kugelhopf. The villages are so beautiful, it almost looks like a backdrop of a movie…. I was standing in my kitchen reading this post on my iPad whilst it was being charged. How exciting!! The photos, the photos.. For a second I thought: I wish this post had sound. It’s just that I had to step away from the screen to get a mini baguette and cooked pork but didn’t want to interrupt my reading. Loved every word! Sarah, my friends had a similar reaction when we were there – they said it was like we were in Disneyland or something ! haha ! Valentina, and I always love every word of your comments, obrigada ! Picturing you in the kitchen with yumm, baguette and cooked pork ! Bom apetite !! I just love this post! I can just feel your happiness sharing the experience with your friends from NY. The picture perfect views are just amazing. 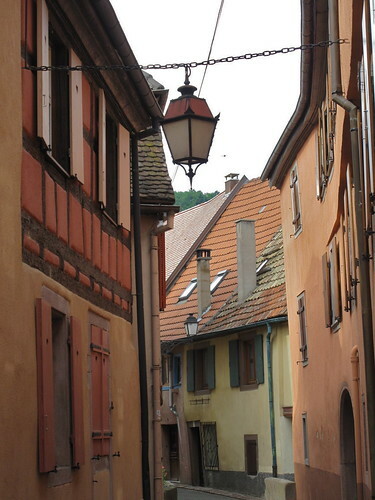 I do remember my visit to Colmar and just wanted to stay there and wander the streets. The buildings and that wonderful kugelhopf made especially for the Roussets. How delicious it must have been…..so jealous! This is one part of France I have always wanted to visit. I love the French/German influence. 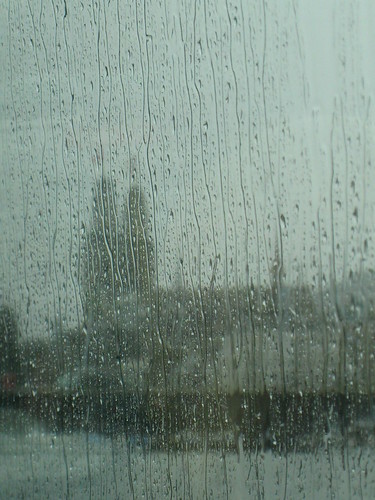 Again, I feel like I’ve been there personally now with your vivid descriptions and your wonderful story telling. 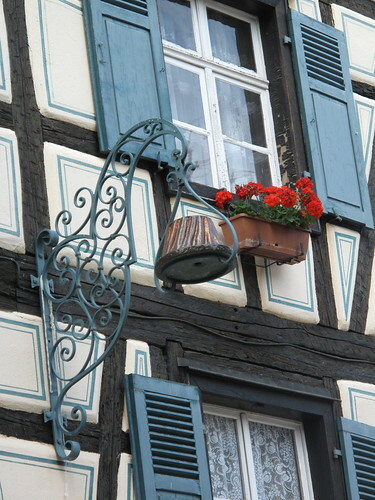 I would love to have been the lucky recipient of that kugelhopf in the window. I just had to giggle when I saw the picture with your name on it. Can you crave a good you’ve never had before? Because I suddenly find myself craving this kugelhopf thing! I’m not sure if I’d eat it with foie gras, but it does look delicious! 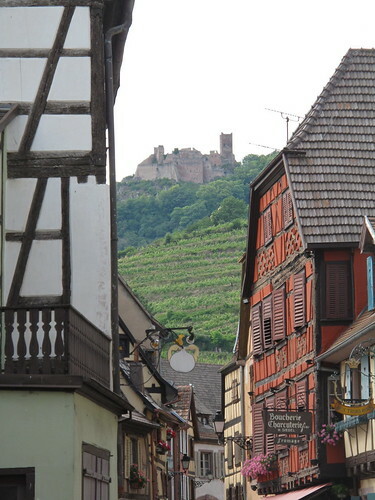 And boy, these shots sure are making my wheels turn – I wonder if I can convince my husband to do a little road trip to Alsace before summer’s end? 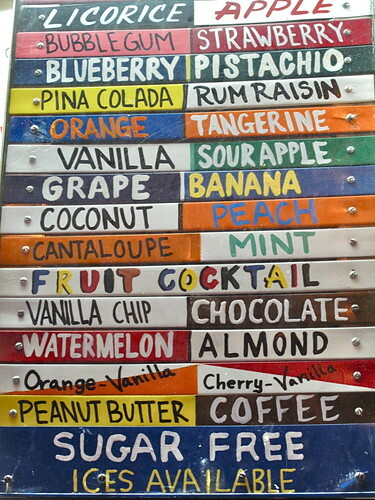 What a fun post! 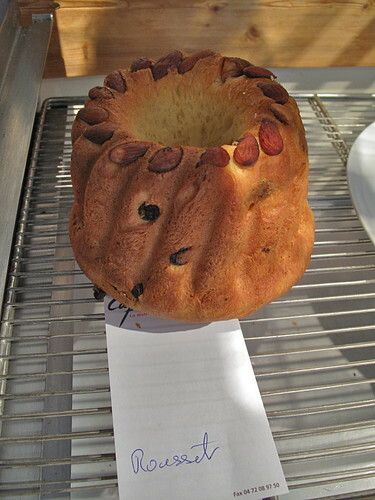 My wife baked a cake last night and used a kugelhopf mold for it…since she’s Moroccan and I’m melange of whatever (but ultimately my last name comes from Alsace) we didn’t know what the mold was called…how very funny to be eating kugelhopf in Morocco while I learn what kugelhopf is. The signs in Brussels would have been in French and Flemish. Vago, thanks so much ! 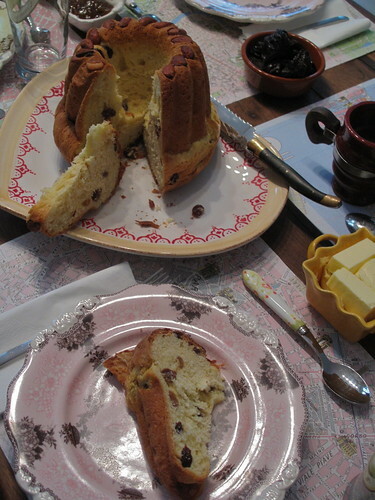 I’m loving this whole scenario — a kugelhopf mold in Morocco from a fellow American but with an Alsatian last name, at the same time I did this post ! 😉 Bet it was delicious too. I loooove Morocco, hope to get back soon. Thanks for the comment, happy to discover your site now ! Angel of the North, exactly – and the long words I was referring to on those signs were definitely in Flemish, pas en français. 😉 (Didn’t mean to make it sound like it was German in Brussels, in my comment above). Thanks ! Illhaeusern is my favorite of the town names, because I stumbled over it for a good thirty seconds, trying out different pronunciations under my breath. I decided to leave it alone when I became distracted by the vibrantly-colored homes and shops. And by the mention of storks! Maybe those were FRENCH Romans near Vienna whose Kugelhopf forms (eventually unearthed) were used to bake the first Kugelhopfs? 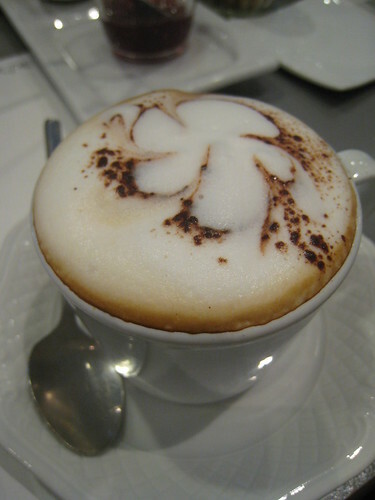 Juliane, thanks so much, and glad to discover your blog as well ! Emma, say it aloud with me: “Illhaeusern”… [i tried to copy the French phonetics here, but they just show up as question marks, oh well.] 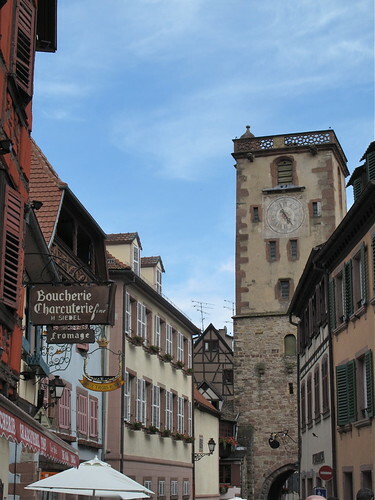 Meanwhile, it’s a town I wouldn’t mind going to, at all – quite famous for the restaurant there, Auberge de l’Ill. Perhaps one of the best in France. Meanwhile, I should have known I could depend on you to bring this post to… hamburgers. haha ! Always love your comments Emma, thanks ! Loved this post! So glad I got to experience this with you, Miss Kugelhopf! What a special day that Ben and I will always remember. Thanks for being such an excellent tour guide. 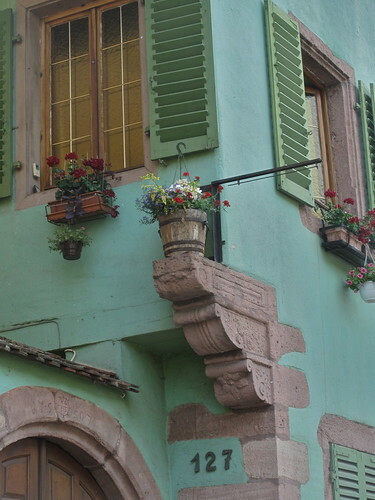 Liz, it was absolutely a pleasure having you and Ben here, showing you my favorite place, Alsace and my home, Zürich. A special day that both Olivier and I will always remember too. That looks absolutely divine! And I love that Remy has a small shrine to Texas in the shop….it must be true that people have to possess diversity in their lives, and the more they have of this diversity, the more they become addicted to that feeling of suprise in relation to the phenomenon they are experiencing-like when one has tasted tabasco sauce for the first time (everybody’s surprised). Of course, that phenomenon can be anything-whether a vacation, book, or even food (haha…) Remy simply wants to remember the amazing sensation that he experienced when he realized that Texas was so different from Alsace. Do you think that this was Remy’s reason? PS: PLEASSSE check out my blog, the place where I extract philosophy from those books my soul experiences and apply it to our enigmatic lives. The url is //meditationsofateenagephilosopher.blogspot.com/ Thank you! I just wanted to comment on your blog and let you know how much I enjoyed it. 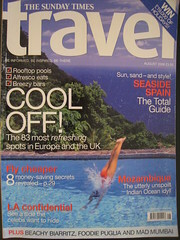 We go to Europe every year, the last two have been to Germany and Austria at Christmas. I too love kugelhopf…I had a slice most mornings that it was on a breakfast buffet. 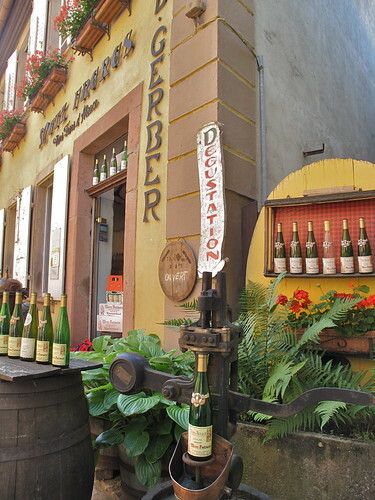 It’s been three years since we have been to the Alsace and your beautiful photos bring back nice memories. Uomo di Speranza, what an interesting way to look at things, thank you for sharing your perspective – and your blog link too. We’ll have to ask Remy himself if that is his reason ! Karen, thank you so much. I am thrilled to help bring back wonderful (and delicious) memories of your past trips to Europe — and especially of eating kugelhopf in the morning. You should try baking it one day, the smells in your own kitchen would bring back even more memories I bet ! 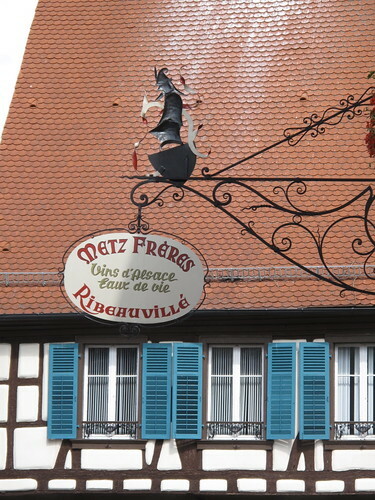 If you like Christmas Markets – give Ribeauvillé a try. 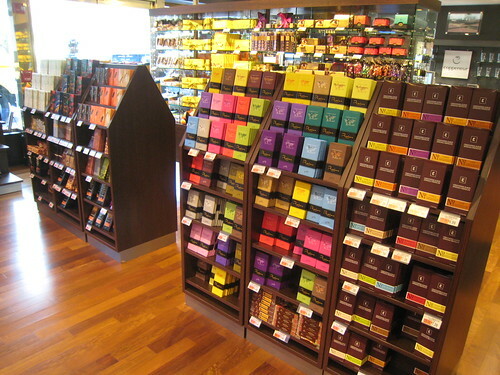 It’s a wonderful place, as it offers a nice mixture of the normal shops and some stalls. It becomes more special still when having their “medieval Christmas Market” – even then it’s not as touristy and overfilled as e.g. 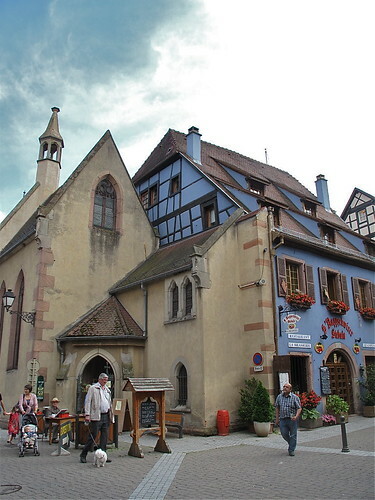 Colmar or Strasbourg. Marcy, thank you – I’m so glad you found MyKugelhopf too ! And how great that you had a tasting with Hande in Rome. And next you’re off to Strasbourg in December — there is no better time. 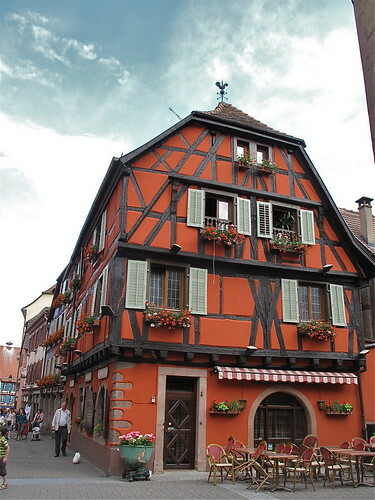 Alsace is one of the best places in the world to be during the Christmas season. The markets are extraordinary. Please have a kugelhopf (or two) for me ! 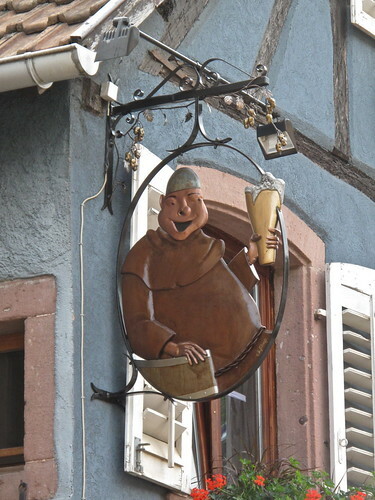 If you go to Colmar, here are a few addresses for you too: //mykugelhopf.ch/tag/colmar/ – Enjoy !! The Texas shirt is not so out of place when one considers that thousands of Alsatians immigrated to Medina County, Texas, in the 1800s. Castroville, just west of San Antonio, is peopled with Alsatian descendants who are keen to preserve their history, including their links to their ancestral homeland. Oh and yes you can buy a very good Kugelhopf in Castroville at Haby’s Bakery. They garnish it with whole pecans, Texas-style.